This recipe started as a Women’s Weekly recipe for Lemon Curd Cheesecake. However, by the time I actually got to serving this recipe, I think it only had three ingredients in common with the original – eggs, butter and cream cheese – so I feel I can justifiably claim it as mine. It’s really delicious, but also quite dense and heavy (as you would expect from a baked cheesecake), so share it with a lot of friends. Melt 125g of the butter. Put the biscuits in a food processor and pulse until they are breadcrumb-like. 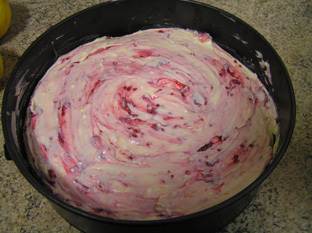 Mix with the melted butter and press onto the base and a little up the sides of a 22cm springform tin. Put in the fridge for 30 minutes to firm up. 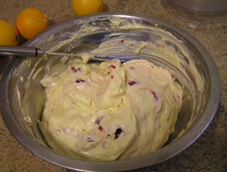 Soften the cream cheese (or you will go demented trying to beat it and the texture still won’t be much good), and beat with the sugar and the zest of one blood orange and half a regular orange until smooth. I use a fork, but I believe normal people use actual beaters. Beat in the eggs one by one, then finally fold in the raspberries. Preheat the oven to 180. Spoon the cream cheese mixture over the biscuit base and smooth the top. Bake for about an hour, or until set (you may need to turn it down and cook it a little longer to achieve this without burning it). Let cool to room temperature in the tin. Why even cook it? It’s already good! Oh. That’s why. Also yum. While the cheesecake is in the oven, make the curd. Put 60ml of blood orange juice into a microwave-safe bowl with the zest and sugar, and beat together very briefly. 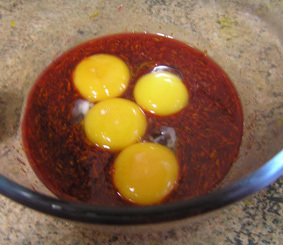 Add the egg yolks and beat until smooth. Chop the butter into small pieces and stir in, then microwave at 50% power for about 6 minutes, removing from the heat and whisking every 60 seconds, until thickened. The colour will get paler, and if you got any egg-white in with your yolk, it will also get more blue. You can fix this with a pinch of citric acid (which also has the nice advantage of making the curd tangier – I did this for flavour reasons, but liked the fact that it made the pink more definite. Blood orange juice and zest with sugar and egg yolk. How gorgeous does that look? If only the curd came out that bright! Let the curd cool to room temperature, then spread over the cooled cheesecake, and put the whole lot into the fridge to set fully for at least three hours or overnight. Remove the sides of the tin carefully – if you are really clever, you will be able to get a knife and an egg-flip thing under the bottom of the cheesecake and get it off the tin and onto a plate without breaking the cheesecake. I am very nearly that clever. Well, you could always make the original recipe, which uses lemons instead of blood oranges in both the cheesecake and the curd, no raspberries, plain biscuits, and white caster sugar. I would not make this with ordinary oranges, however. 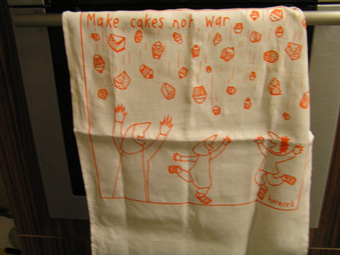 A bit too sweet and possibly also a bit too insipid. It might be nice with pink grapefruit, though. I’d give that a try (though I would skip the raspberries, and use gingernut biscuits instead of chocolate). I don’t think you can make this dairy-free or egg-free without completely changing its character. Both dairy and egg have too much structural importance in the recipe. 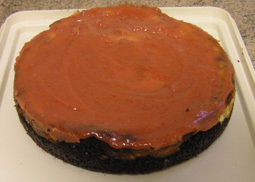 You’d do better to start with a tofu-based vegan cheesecake recipe, and work out how to get those flavours into it, and replace the curd with a mixture of blood orange zest and juice with sugar and arrowroot. Gluten-free, however, would be easy – you just need to find some gluten-free biscuits that you don’t hate (I say ‘don’t hate’ rather than ‘like’ because the quality of the biscuits is not terribly important in this recipe). Recipe: Orange Me Up (Scotty)! Blood orange curd? Holy deliciousness! This sounds amazing. Thank you! I love blood oranges and use them in anything I can think of, but this was definitely one of my better ideas! 1/2 cup of golden caster sugar? Not a mass? Are you certain you’re feeling well? Also, you are forgetting just how much sugar there is in the biscuits. And the raspberries. And the curd. WOOHOO!! 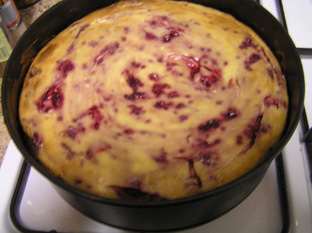 What an interesting cheesecake recipe! Never seen one like this. It’s hard to get blood oranges in the UK – well around my way it is – for some reason, but I will have a look. and THANK YOU FOR YOUR YUMMY SITE. I’m glad you like it! And I’m so sorry I never replied to your email – life got very busy and I had a feeling the answer was no, and it all fell off my radar. I’m very glad you found something appropriate. I think you will have difficulty finding blood oranges in the UK at this time of year – they are very much a late winter – early spring sort of fruit. But it’s just lovely with lemons and lemon curd, too.